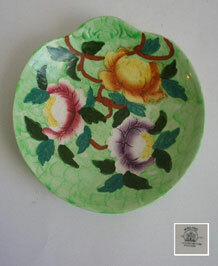 This is a beautiful Maling dish in vivid colours and in the 'Peony Rose' design on a green thumbprint background. This is quite a good useful size and has a lip at one end for lifting. This is a very attractive design. Marked to the base MALING NEWCASTLE ON TYNE ENGLAND and painters marks. CONDITION:Excellent. Has light age related crazing but no chips or cracks.